Last night as Dan was going to bed he told me there were a couple of moths at the front door. It had been a lovely afternoon, very spring-like in its mildness, but it was still quite chilly by the time the sun set. When I went down to check out the moths, the thermometer read 2°C (35°F), which is hardly a temperature that a moth should be out and about at. But some of my surprise disappeared when I saw which species the two moths were. Both at the front light, and three more individuals at the back light, were Bruce Spanworms (Operophtera bruceata). Up here where I live, these are usually the last species of moth I see flying each fall. They’re particularly cold-hardy and I often see them active at temperatures that would keep most other species from flying (such as last night). They’re frequently seen out and about during the day, too, pale fluttery insects that catch the low autumn sun on mild afternoons. The appearance of the Bruce Spanworms heralds the end to the mothing season for this year. Now that it’s November (how did that happen?) there may only be a couple more nights where the temperatures are warm enough for stuff to be flying, and like last night, they’ll likely be mostly these spanworms. Time to pack up the lights and the sheet and the jars for another year. They’ll be tucked away in the basement for the next four months, awaiting the first moth of spring on a mild evening in March. 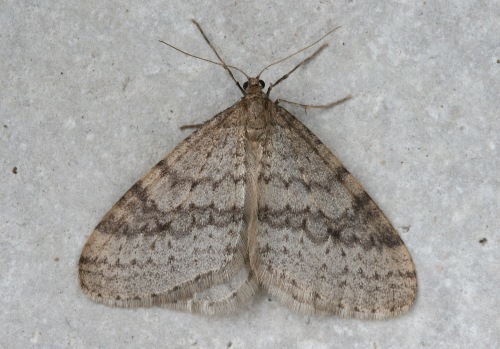 Too bad moth season is over :( I saw one of these guys yesterday and today as well. I noticed the little fringe along the bottom and inside edge of the wings. Any idea what purpose that serves? When I was walking in the woods today I was surprised to see dragonflies. Little meadowhawks, I assume. On Nov. 05, 2011 in the woods on watch for deer, the most ammazing thing I have ever seen ,after a very frosty night by the Boreas river outside of Minerva, NY I witnessed hundreds of thousands of the tan wood moths fluttering out of the leaves and trees trying to soak up the wormth of the sun, I became almost mesmermized by the moths dance. That Knob I was on had to have at least 100,000 flying around that morning.